The first time I saw the alley, I was nine years old. My mother and father were fighting, and I ran out of our rented brownstone in tears. Their voices jangled in my ears like glass on paving stones. At the corner I turned right instead of left, and there it was. 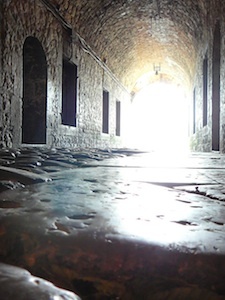 The entrance was not hidden or obscured in any way, but there was something off-putting about the dim, grimy passageway that discouraged investigation. I had certainly never been there before. I was not allowed past the front yard alone. And yet, I knew this place, these sagging walls, the vacant stares of the bricked up windows. I did not go in. I stood for a long time, gathering my courage, until my father found me and took me back inside. I fell asleep that night to the sound of hushed arguments and water dripping on asphalt. I saw the alley again when I was fifteen, passing it by on my way to the bus station, and a third time two years later. That night James knifed a man while I held the door. It was all on the surveillance tape, our faces clear against the backdrop of grainy shadows. James ran off, and I looked for someplace to lay low. There, between two storefronts I had passed a hundred times, the alley beckoned. It was a good place to hide: a place away. I was cold and probably more than a little high. It is very hard to remember those days. But I lingered there too long. James found me staring at nothing and drew me away with laughter rooted in the absolute. His presence was an anchor. I am thinking of him now while you are sleeping, sweat-sweet and still tangled in the sheets, because the alley was there this morning when I woke. I can see it now, a dark opening in the garden wall. If I tread softly, I can slip out the back door without waking you. This post was written in response to two writing prompts. By the way, if you haven’t seen it, check out my list of past Trifecta and Trifextra winners! This week, write a fiction or creative non-fiction piece where fate plays a prominent role. You can write from the position of a complete belief or absolute disbelief in the role of fate in our lives or the lives of our characters. This entry was posted in Fiction, Writing and tagged trifecta, write on edge. Bookmark the permalink. I enjoyed the journey through the hiding space, that sometimes became an escape of comfort. Nicely done. Wow! That was cool! It took me a minute to realize it was a metaphoric hiding place. Many thanks! I like your interpretation. I had actually intended it to be not metaphoric, but a real (if magical) place that she is meant to go into. Love the ending. Nicely done. Ooof…just on the edge of crazy. You’ve made this alley a character in its own right. Very creepy tale. Yes – that was part of my intention! Thank you! Thank you, Janna – I love the restriction of word limits, and seeing how creative I can be within those bounds. I love the story and finally at the end realize it is a metaphorical place. Nicely done. I love how you can read this and see the alley as some sort of magical entity, or you can read it as a symptom of her deranged mind. Hmm, if that’s the case, I didn’t make it clear enough. The idea is that she’s fated to go into the alley. She’s been fighting that fate the whole time. Alleys are scary places in the dark, and home to many a forgotten dream. I think you captured the setting perfectly. I love that the windows stare vacantly. Well done! Thanks for linking up with Trifecta this week. Like always, you’ve given us a truly lovely piece. I really enjoyed the idea of the alley as a place to hide people who need to run. I thought it was clever how you glossed over the second meeting with the alley, leading straight into the third. The technique gives us three separate incidents without reading like a high school essay. (First. Next. Finally.) Great job. I love the creepy feel you give this piece. Every description lends itself to that dark spookiness well. Great job! I’m pretty impressed with this one. The alley provides a creepy factor, but I also feel there is something possibly magical about it? Or is the alley a part of the speaker? It’s hard to tell, but I like your phrasing. I left it a little too vague, I think. The alley is definitely magical, in that it “follows” her around. I love how many different interpretations there are on The Alley. As pleased and flattered as I am about the praise, I realize that much my intent hardly came through at all, which is an important thing to learn. I really like the first three paragraphs. Really well written. After that I got a bit lost. I agree with previous commenters. The alley was a character all it’s own, and I thought this piece was fantastic. I love “sagging walls” and the description of the windows. Great job! I’m thinking the alley appears only when she most needs it. And for some reason, she’s never entered it. I wonder what will happen when she does and why it’s appearing now. Great job. It had a very magical feel to it.